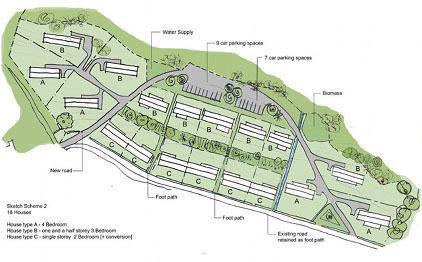 A feasibility study for a five acre site in Inverie, Knoydart. This south facing site, over looking Loch Nevis, is bounded to the south by the road and to the north by a a steep bank leading to some spruce forest. Through careful negotiation with the roads department and planning office to increase the potential of the site from around 6 to 12 dwellings, with an affordable housing remit of 25%.